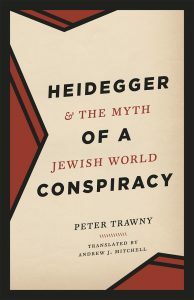 Trawny appears to recognize this perplexing problem when he confesses that ‘[h]ere and there I have even allowed my own thoughts to be “contaminated”’ by Heidegger’s thinking of ‘“the purification of being”’; and self-critically asks: ‘Have I consequently overinterpreted Heidegger’s statements on world Judaism?’ (HMJWC, 101). Amidst the fury and bombast of ‘The Heidegger Wars,’ in which bellicose critics often take their own projections of sinister evil-doings as evidence of Heidegger’s Nazi anti-Semitism, Trawny’s self-critical circumspection is no doubt therapeutic; but it makes it difficult for the reader to decide: Which side is Trawny really on? Is he really an apologist for Heidegger’s Nazi anti-Semitism, as Faye, Rastier, and Wolin argue? Or is he, contrarily, a critic of Heidegger‘s Nazism, as von Herrmann and Fediér insist? Propagandist or critic? Apologist or antagonist? Defender or accuser? Which is the real Peter Trawny? And which the real Martin Heidegger? Trawny’s ambivalence about Heidegger’s alleged Nazi anti-Semitism leaves the reader, too, wandering in a no-man’s-land between the two embattled sides and caught in the critical cross-fire, while perhaps also wondering: is it really necessary to take sides? Can’t we settle this without all this bombast and battle-fury? 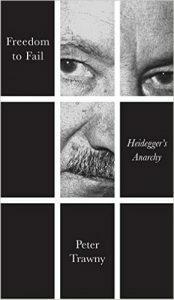 And in taking sides in ’The Heidegger Wars,” isn’t the contemporary critic simply endorsing one side or other in the pitched battle between ‘Stalinists‘ and ‘Nazis,’ ‘communists’ and ‘fascists,’ which raged in Western European intellectual circles in the 1930s, and in which so many German, French, Italian, and English intellectuals (Pound, Eliot, Hemingway, Yeats, Gide, Céline, Marinetti, Schmitt, Junger, Benjamin, etc.) were battle-hardened casualties or walking wounded survivors’? After failing to decide for either side in HMJWC, Trawny takes up these questions again in Freedom to Fail: Heidegger’s Anarchy (German title: Irrnisfuge: Heideggers An-archie), in which he argues that Heidegger’s ‘contamination’ by Nazi anti-Semitism is an effect of his Nietzschean tragic willingness to follow wherever the fatal errancy (Irrnis) of philosophic thought might lead, even to the catastrophic brink of wholesale annihilation in the Nazi Holocaust or the Jewish Shoah. Although Trawny ‘emphasiz[es] that philosophy and anti-Semitism … are mutually exclusive,’ and attempts, once again, to draw a strict line between them, he still poses the contagious questions: ‘Yet what happens to philosophy when we attempt to exclude it in advance from the dangers of anti-Semitism? What happens to philosophy when we exclude it from errancy [Irre]? Is that even possible? Wouldn’t this attempt to immunize philosophy be the worst error [Irre]? Overcoming anti-Semitism,’ Trawny finally concludes, ‘can only succeed by drawing near it.’ Or, perhaps, Trawny implies, by being infected by it? By ‘suffer[ing] it, go[ing] through it’? (FFHA, 16). Like a contagious infection or a fatal disease?—which must be purged or cleansed before sanity and health can be restored, but which also risks setting the body against itself, in that strange dis-ease of counter-terrorist/terrorist violence which Jacques Derrida describes in ‘Auto-Immunity: Real and Symbolic Suicides.’ Here again, Trawny’s thinking comes dangerously close to replicating the suspect thought it ostensibly critiques, and, while attempting to quarantine the ‘contamination’ of Nazi anti-Semitism, actually becomes infected by it, and is not purged or cleansed, simply by critical thought, just as the political body of the German Volk or the Russian narod was not cleansed or healed by the purges and pogroms of the Stalinist Great Terror or the Nazi ‘Final Solution to the Jewish Question.’ By contrast, Heidegger’s thinking is surprisingly un-contaminated by this peculiar strain of contagious thought, through which the German National Socialists and the Stalinist Soviets each attempted to forge the solidarity of the political body by fabricating the sinister menace of a fictitious national enemy (whether ‘Jews’ or ‘capitalists‘) who must be cleansed or purged to ensure its security and health, and thence also attempted to mobilize the terrorized masses against these fictitious enemies, finally resulting in the Great Western vs. Eastern European civil war of ‘Stalinists’ vs. ‘Nazis,’ ‘communists‘ vs. ‘fascists,’ sometimes called World War II. Trawny’s scathing critique of the ‘contamination’ of Heidegger’s Nazi anti-Semitism draws upon the sophisticated strategies of critical textual analysis characteristic of contemporary postmodernist theory (deconstruction, post-structuralism, hermeneutics etc. ); and Trawny is clearly attentive to the subtleties and nuances of Heidegger’s thinking that more hostile critics ignore. But what Trawny neglects to observe is that the Black Notebooks were written in the specific world-historical context of Nazi Germany in the 1930s and 1940s; and Heidegger’s thinking of ‘the history of Being’ cannot finally transcend that specific world-historical situation, any more than, for example, Hegel‘s Phenomenology of Spirit, as the young Karl Marx argued, could escape its complicity in The German Ideology of the 1830s and 1840s (Marx and Engels 1978). The Black Notebooks were written in the wake of the Nazi coup d’etat in Weimar Germany, and, specifically, following Hitler’s appointment as Chancellor (January 30, 1933), the declaration of a state of emergency (February 28, 1933), and the Gleichschaltung (conformitization) of the German universities (March 23, 1933), which sinister events describe the ominous prelude to Heidegger’s brief tenure as Rector Magnificus at Freiburg University, from April, 1933 to April, 1934. During that same period, the Soviet Communists were carrying out the Ukrainian terror famines, which resulted in the death by starvation of some 3.5 million Ukrainian peasants in 1933 alone, thereby provoking German fears of a Stalinist communist takeover, and greatly increasing German support for the Nazi Party and Hitler. Heidegger appears briefly to have subscribed to the equation of ‘Jews’ with ‘communists’ which was current among German conservative revolutionaries like Carl Schmitt; and Heidegger’s Schmittian comments about ‘the enemy’ which had ‘attached itself’ parasitically’ to ’the innermost roots of the Dasein of the people’ in the Being and Truth lectures of 1933-4 (Heidegger 2010, 73) are probably anti-communistic rather than anti-Semitic, although they lend themselves to either interpretation, and cannot finally be absolved of complicity in ‘the purge mentality’ of ‘The Stalin/Hitler Wars.’ During Heidegger’s writing, the Nazi Party and the S.A. completed their purge of Social Democrats and Communists, begun with the assassination of Karl Liebknecht and Rosa Luxemburg in 1919, after which Hitler personally presided over the purge of the Röhm faction of the S.A. (June 30, 1934)—an event to which Heidegger ascribed his disillusionment with the Nazi Party and the Fuhrer—and the Nazis implemented the Nuremberg Laws against German Jews on September 15, 1935. And by the time the more arguably anti-Semitic remarks begin to appear in the Black Notebooks, the German invasions of Austria (April 10, 1938), Czechoslovakia (October 20, 1938), and Poland (September 1, 1939) had taken place, the Molotov-Ribbentrop Pact had broken down, and Germany invaded the Soviet Union on June 22, 1941. In a speech at the Reichstag on January 30, 1939, Hitler had declared that the consequence of a world war would ‘not be the Bolshevization of the earth and thus the victory of Jewry, but the annihilation of the Jewish race throughout Europe’ (Snyder, 2010, 114): a threat which finally became a self-fulfilling prophecy when ‘The Final Solution to the Jewish Question’ was dictated at the Wannsee Conference on January 20, 1942, and implemented in the S.S. death camps in Nazi-occupied Eastern Europe, between 1942 and 1945. Derrida, Jacques 2003 Auto-Immunity: Real and Symbolic Suicides Philosophy in a Time of Terror ed. Giovanna Boradorri (Chicago: University of Chicago Press): 85-136. Heidegger, Martin 2010 Being and Truth trans. Gregory Fried and Richard Polt (Bloomington: Indiana University Press). Heidegger, Martin 2014 Gesamtausgabe Bd. 94-97, ed. Peter Trawny (Frankfurt am Main: Vittorio Klostermann). Jaspers, Karl 1971 Philosophy of Existence trans. Richard F. Grabau (Philadelphia: University of Pennsylvania Press). Marx, Karl and Frederick Engels 1978 The German Ideology The Marx-Engels Reader ed. Robert C. Tucker (New York: W. W. Norton): 146-200. Picht, Georg 1988 Die Mach des Denkens Antwort: Martin Heidegger im Gespräch ed. Guenter Neske and Emil Kettering (Tuebingen: Guenter Neske Pfuellingen): 175-183. Snyder, Timothy 2010 Bloodlands: Europe Between Hitler and Stalin (New York: Basic Books). Wolin, Richard 1998 French Heidegger Wars The Heidegger Controversy: A Critical Reader ed. Richard Wolin (Cambridge: MIT Press): 272-300.